Even though a single Tweet has yet to be sent, Pope Benedict XVI’s Twitter account totals 432,96 followers, with many more expected to join that number. The Pope presumably playing with his Twitter account. 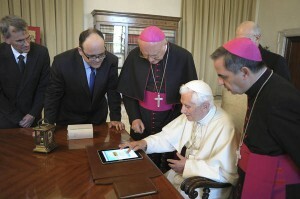 The Vatican opened the account as an attempt to use the new media platform to connect to new audiences. The Pope’s primary Twitter handle, @Pontifex, is the English-speaking account, one of eight to be exact. The other seven of the Pope’s Twitter accounts end with a suffix respective to the account’s language – e.g., @Pontifex_de for German and @Pontifex_ar for Arabic. Among the Pope’s current followers is Israeli President Shimon Peres, who Tweeted at the Pope, “Your holiness, welcome to Twitter. Our relations with the Vatican are at their best & can form a basis to further peace everywhere.” Peres is 89 years old, making him older than Pope Benedict. When asked if the Pope will follow anyone with his Twitter account, the Vatican said that the Pope will not be following anyone but himself. Glancing at the Pope’s Twitter account shows that he is currently following seven other accounts, though they are, in fact, the language variants of his primary account. The Vatican stated that the first of the Pope’s Tweets can be expected on December 12, and that all of the Tweets will remain focused on contents of the Pope’s weekly general audience, Sunday blessings, and homilies on major church holidays. They may also include the Pope’s reaction to major world events, such as natural or man-made disasters. The first Tweet on December 12 will definitively be sent by the Pope – meaning he himself will be pushing the button to send the Tweet into cyberspace – but future Tweets will most likely be written and sent by aides. All he’ll have to do is approve the message.